On September 16th, 2011 I headed 2 1/2 hours northeast to Minocqua, WIsconsin, to fish 2 tournaments - an Open hosted by the Northern Lakes Bassmasters on Saturday the 17th, followed by and Angler's Choice Series tournament on Sunday the 18th. Both of these tournaments were to be held on the Minocqua/Tomahawk chain of lakes. My tournament partner for both Saturday and Sunday would be George Diller of Altoona, WI. I was hoping that the deep fish I found on my Labor Day scouting excursion would still be in the general vicinity of the waypoints that I marked, but a lot can happen to a body of water in 12 days. During that scouting trip the fish were catchable, but the bites were so light that I knew I was not connecting with every fish that picked up a bait. When you have 60' plus of line out, by the time the bite transmits up the line and through the rod, the odds of the fish dropping the bait before you get a hook in them, is very good. I knew going in to these 2 tournaments that I would need to use the most sensitive rods in my arsenal. Earlier this spring the Skeeter Boat Center became a G. Loomis/Shimano dealer, and I had purchased several rods that would fit my needs perfectly! 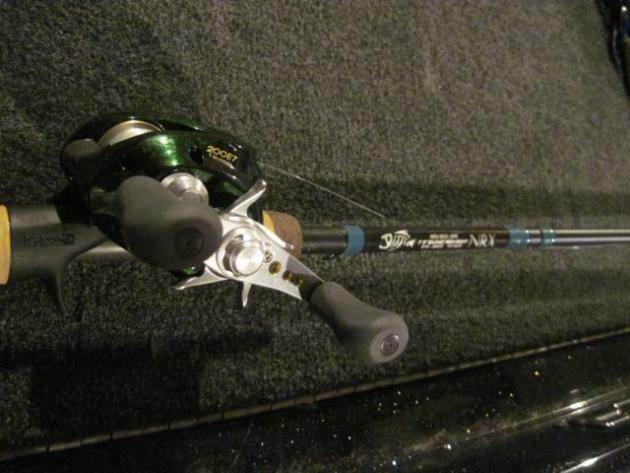 The G.Loomis NRX 852s JWR - This is a 7'1" Extra Fast action Medium power spinning rod that I chose as a drop-shot rod. This is the lightest, most sensitive spinning rod I have ever have ever handled, but yet the extra fast taper lets you maintain complete control of the fish from the deepest depths, all the way to the boat! The G.Loomis NRX 873C CRR - This is a 7'3" Fast action Medium-Heavy power casting rod that I chose as a Carolina rig rod when using leaders shorter than 36". Once again, this is a super light rod with which you can feel every rock or pebble that the sinker drags over - you can also feel a transition from gravel to sand, sand to muck, etc. Equally important is the backbone that the rod has to sink a hook in the hard bone of a fish's mouth even with 100' of line out. The G.Loomis NRX 893C JWR - This is a 7'5" Extra-Fast action Medium-Heavy power casting rod that I chose as a Carolina rig rod when using leaders longer than 40". This rod has all of the characteristics of the 7'3" rod I chose, but the extra-fast action helped me pick up bite transmissions when using extremely long leaders. On Saturday morning the air temperature was in the mid 40 degree range and the water surface temperature was in the upper 60 degree range. This condition created a low fog that delayed take off for a little while. When we arrived at our first spot, the waypoint that held fish 12 days earlier was barren. 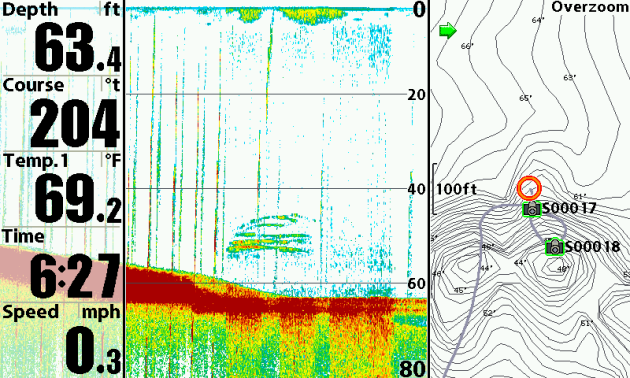 Feeling that the fish may have moved up to the closest hump we sidescanned the area a with our Humminbird 1198 and and marked a school of smallmouth within 400' of our original waypoint. I marked a waypoint on the school and drove over them with the 2D screen to determine the size of the school. These fish were suspended at the 46' to 55' ranges in 64' of water and were positioned directly below 2 schools of baitfish (Ciscoes) See the first picture below. Within the first 5 minutes of fishing this school, we caught 3 small keepers with the drop-shot rigs on the NRX rods. The tournament limit was 6 fish per 2 man team so we were half way there. Almost as quickly as the fish started biting, the whole school turned off. We tried multiple presentations and techniques, but we could not produce another fish. The next several hours we went from waypoint to waypoint and despite marking fish, all of the schools we fished were in a negative feeding mood. Finally, at 2 pm we found a hump in 32' of water that had a school of cooperative fish suspended at 27' to 30 ' (see the second picture below). I positioned the boat directly over the school and we tried the drop-shot technique for 15 minutes to no avail. I dropped a marker buoy approximately 10' to the side of the school and backed the boat off of the fish so we could drag Carolina rigged baits threw the fish. When fishing deep with a Carolina rig, it is very important to make as long of casts as possible as to have a horizontal presentation and keep the bait in the strike zone longer. My choice of reels for long casts, is the Shimano Curado (see the 3rd picture below to view the Shimano Curado on a G. Loomis NRX). The Curado is a light but powerful baitcasting reel with an adjustable brake system that will let you cast a country mile without getting a backlash. Once you have a fish on, the Curado drag system is the best in the business! The first cast through the school yielded a keeper smallmouth but the fish immediately shut down. I pulled back on top of the fish to see if they were gone. The school was still there, but had risen another 2' in the water column. I backed the boat out again and in an attempt to get the bait to ride higher in the water column. I tied on a 12 lb. test 50" monofilament leader to the Carolina rig with a floating bait. Since monofilament line floats, this setup would let the bait move right through the school at eye level. The next 2 casts in a row yielded consecutive keepers - we now had a limit but we had to be back at the landing in 7 minutes for weigh-in so we had to leave. We loaded the boat, and I actually considered just throwing our fish back because our 6 fish limit was small. I started watching people weigh in one or 2 fish per team and had only seen 2 limits so we knew fishing was tough for everyone. We brought our fish to the scales and they weighed 10.07 lbs. which was good enough for 4th place - that was a big surprise for us. We actually had enough weight to collect a check AND we learned a little something to carry in to Sunday's tournament (I will cover that in part 3 of this blog).